The spring vibes are real, people. After my first winter back in New York from California, I’ve been impatiently waiting for warmer weather. Granted, I’m one big sneeze-ball during this season… but something’s gotta give. All the delish spring treats will be worth it! 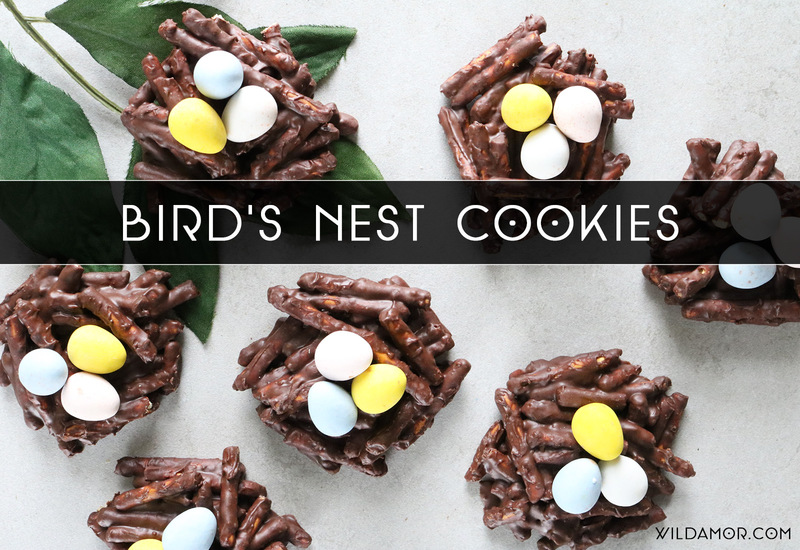 Exhibit A: these charming bird’s nest cookies. I’ve seen these around before, but they were always made with chow mein noodles. However, I’m obsessed with chocolate-covered pretzels. So I knew I had to give a pretzel stick version a shot. And it worked! 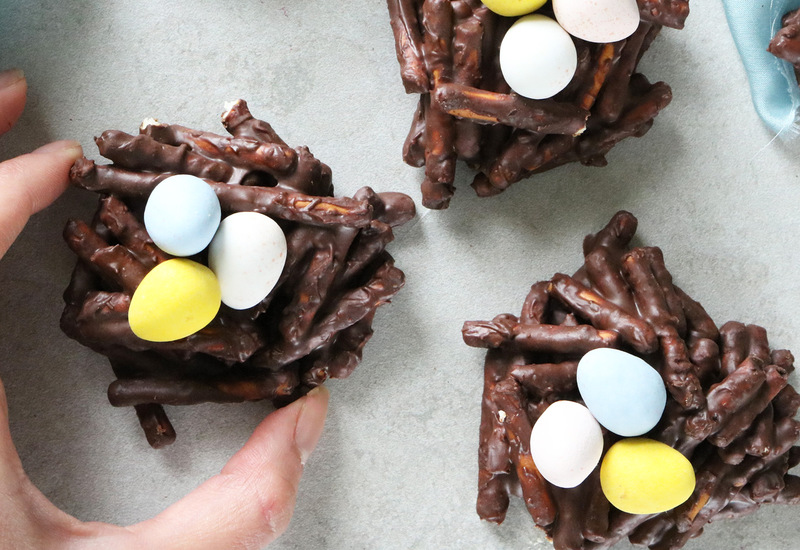 Here’s how to make this darling spring/Easter/whenever treat. * Pretzel sticks are a bit tricky to measure in cups, since they don’t pack in perfectly. This is a rough estimate of how much you’ll need. The safest bet is to keep an entire bag on hand, just in case. Make a double broiler. Place a stainless steel bowl over a pot of water, making sure the bowl doesn’t hit the water. 1. Over medium heat, melt half the chocolate chips in the bowl. Mix it every now and then, and be sure to keep a close eye on it. 2. If you’d like, add some coconut oil (or any other type of oil) for a smoother consistency. 3. Once completely melted, add the rest of the chocolate chips and peanut/nut/sun butter. Mix until thoroughly melted and combined. 4. Turn the heat down to low. Add the pretzel sticks, alternating between breaking them in half or even smaller. 6. Mix well. The chocolate-to-pretzel ratio should be fairly equal. In other words, there shouldn’t be chocolate pooling at the bottom of the bowl. Keep adding broken pretzel sticks until everything is (somewhat) evenly coated. 7. With a large spoon, scoop out the chocolate pretzel mixture onto a foil or parchment paper-lined metal sheet. 8. Make a small indent in the center of each one. You can use your fingers or a spoon. 9. Add three candy eggs to each cookie. Leave to harden completely. Are these actually cookies if they’re just made with chocolate-covered pretzels? Maybe. They’re prepped kind of like cookies, so I’ll call them that. 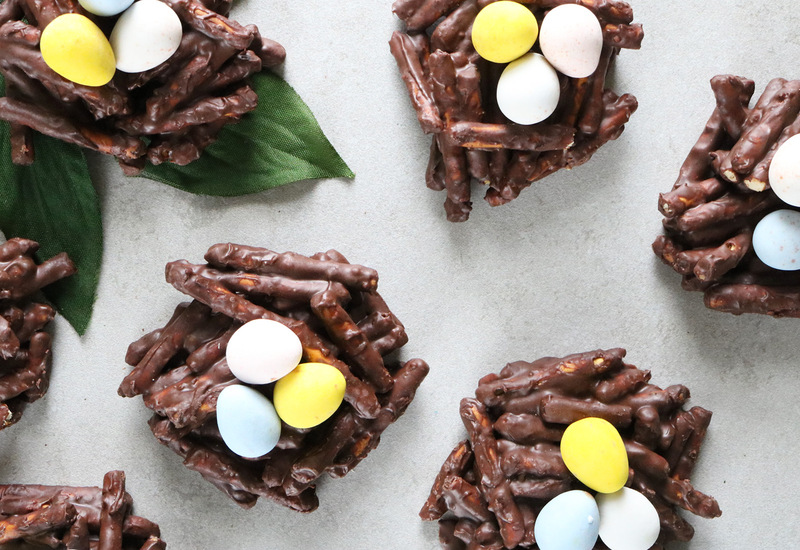 Even if you don’t celebrate Easter, these treats are perfect for any general spring gathering. A baby shower, perhaps? For more egg-themed projects, check out Geometric Indigo Shibori Eggs and Sailor Jerry Tattoo Eggs!